The ascension of the Lord Jesus Christ one of the twelve major Christian holidays. It ends the memory of the Orthodox people of the events of Christ's Resurrection. Ascension - celebration, which is not fixed at a certain date, so every year the celebration of the event changes. The historical event of the ascension of the Lord Jesus Christ says that the Lord after a stay on earth ascended to heaven. First He died, then resurrected, and on the fortieth day ascended to his heavenly Father. The time of the celebration of the ascension of Christ depends on the Dating of Easter. The resurrection is the Central day in the liturgical life of the Orthodox person. This is the beginning of the new liturgical, so some Church holidays take your report from the time of the celebration of Easter. Ascension torzhestvuyte Orthodox Church on the fortieth day. The Scriptures of the New Testament openly told the people that at this time the Lord ascended into heaven. Thirty-nine days Christ was to his disciples and apostles, but then it came time to return to God the Father. In the Orthodox calendar the feast of Christ's ascension is on the fortieth day after Easter. The number forty has always been symbolic for the New Testament and the old. In the days of Moses and the prophets the symbolism of the number 40 indulged in a special sense. She was special and intimate. So, for forty years the Jewish people as a punishment wandered the desert for forty days, Moses stayed on the mountain before receiving the ten commandments. In the New Testament Christ fasted forty days in the desert, and in modern times, on the fortieth day marked the funeral of the deceased. It turns out that in order to know the time of the celebration of the ascension it is necessary to count the forty days from Easter day of the Lord. Worth pointing out that commemoration of the events of the ascension of Christ to heaven always falls on a Thursday. 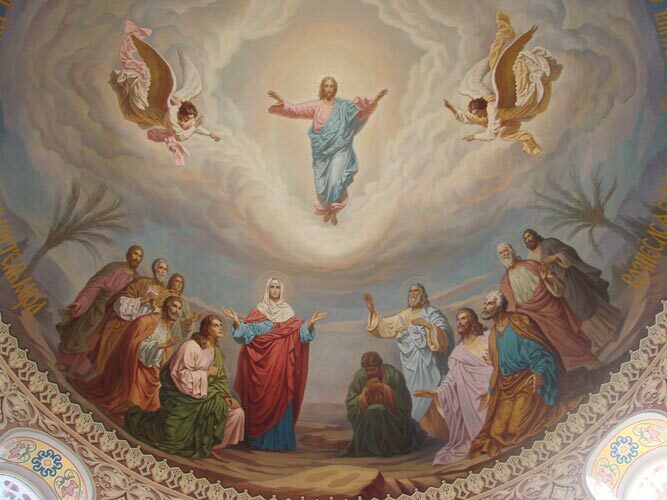 In the Orthodox Christian tradition, the commemoration of the events of Jesus Christ's ascension into heaven is one of 12 major feasts of the Church. This holiday is celebrated on the 40th day after Easter. In 2015, the Ascension of Christ is celebrated on the 21st of may on the new calendar style. The historical event of the ascension of the Lord Jesus Christ into heaven is of special significance in the Redemption of mankind. There are two main issues which are inextricably and directly linked with the ascension of the Saviour into heaven. The first meaning of the ascension of Jesus Christ is the Lord giving man opportunity after death to be where dwells the Savior Himself. That is, the Lord in His ascension, opened to mankind the way to heaven. It is this value, you can often find statements of Jesus Christ Himself. In particular, the Evangelist John the Theologian so quotes the words of the Saviour in his gospel: "...and where I am, there my servant will be also" (Jn.12, 26); "when I am lifted up from the earth, will draw all men to Myself" (Jn.12, 32). Christ was the "Forerunner" in the case of accession of a person after his death into heaven. It refers to the Apostle Paul the Savior in the Epistle to the Hebrews (Heb. 6, 20). In this contexte "forerunner" is one who strides ahead, as if paving the way for the running back. The second meaning of the ascension of Jesus Christ is comprehended from the dogmatic teaching of the Church, and also from the standpoint of the main goals of human life (theosis of the human nature, the attainment of Holiness, being God). So, in the ascension of the Saviour glorified human nature, because according to the teachings of the Orthodox Church, Christ was the God-man. The human nature of Christ was sanctified, ascended to heaven, thereby becoming prichastnye eternal divine glory. The Gospels say about the ascension as the return of the Son to the Father. But it is understood that after the ascension of Christ, God the Son ascended into heaven already with human flesh. Thus, in the person of the Saviour is the return of man to God, sanctification of human nature, the ascension of human nature to heaven. That is why the feast of the ascension of the Lord celebrated in the Orthodox Christian tradition.